Despite its wide acceptance and use, the RS-274X Gerber file format has its own shortcomings. The trouble is the standard does not address all aspects of fabrication and assembly, as required by the PCB fabricator. Although Gerber RS-274X is extremely accurate and reliable when rendering images of copper shapes precisely on signal and plane layers, it does not transfer the layer stackup order accurately. Moreover, data sets and information regarding materials, drill data, netlist, pick-and-place data, bill of materials, test point reports, and more need to be generated by separate processes by different utilities. 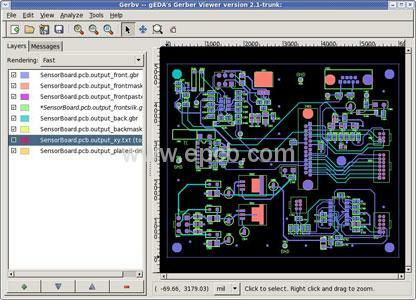 This means, the Gerber RS-274X format is incapable of transferring the complete information from the design domain to the manufacturing domain. In the absence of a defined layer order being transferred to the manufacturer, fabrication has no way of deciding the order of copper layers and may miss a layer or two altogether. With the layer order missing, the drill data may generate holes relative to an incorrect layout. This mismatch can happen with the entire assembly data, and at all aspects of the fabrication process. Usually, with Gerber RS-274X, there is no defined way a fabricator can know about missing output data, wrong source file version, and these can render boards useless. Designers usually get over the above shortcomings using a well-maintained design methodology and best practices shared with the fabricators. In general, they utilize Gerber RS-274X with minimum fabrication issues. However, maintaining ideal conditions all the time is difficult, things can slip up, causing problems to the fabricator and assembly houses, and now they have to face the brunt of the responsibility and sort through the issue. This also leads to fabricators and assembly houses being forced to spend a great deal of time and resource in inspecting and verifying the entire data for all incoming jobs, simply to minimize manufacturing issues.